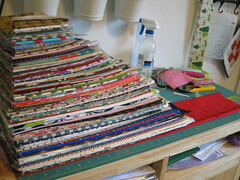 Sew Chaos, Sew Crazy, Sew Wonderful: Whirlwind of a Week! I survived my first week of school! I managed to self-manage my time and get through the first week of classes. Math won't be easy, but I don't think I'll struggle too much. Wendy offered to help me if I need it, and she already help me a bit! Thanks Wendy! I added a sleeve to the back of this beauty, which was a gift to my father-in-law for Christmas. He's huge into scouts - and he loved his gift. He asked for a sleeve on the back so he could show it off properly at the next scouting event. It's a variation of the A Whole New World Tutorial, up-sized to a layer cake with an added skinny sashing. 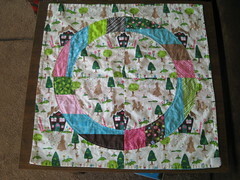 I think adding the sashing turned it into a "grown-up" quilt. I also whipped up two baby blankies - My nieces turned two and are at the stage were they love playing with babies and wrapping them up. I added a bit of Velcro to two of the corners, so that they can wrap up their babies all by themselves. They were a big hit. Since they're two and really don't care if it's not perfect, I played with the Lotto pattern for the month, but pieced the arch. I like how it turned out. 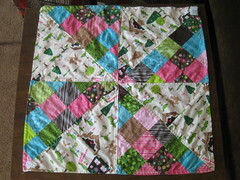 With the second one I played with building triangle units from pieced squares of fabric. The fabric is from Connecting Threads. 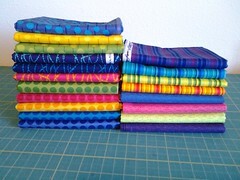 I found a super sale and picked up the strips and a bit of yardage. They washed beautifully - no bleeding at all. I also put away all my works-in-progress. I want to be able to focus on school. The only "quilty things" I have going on is a round robin - The Cotton Robin, and the Block Lotto - I've actually turned down the opportunity to do swaps and challenges. Can you believe it?? This year I'm limiting my fabric purchasing - I got a bit out of hand over the holidays - ordering fabric from just about everywhere. I've told my Mr. Wonderful that I'm going to try not to have any fabric purchases show up on our account - which means - no credit/debit card purchases. If I save my quarters and find a bit of fabric wonderfulness in town - I can buy it - cash only. To help with that goal, before the start of the new year I ordered fabric to restock what I've used over the past year. 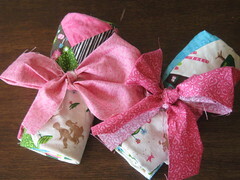 I ordered another 12 lb box of fabric from the Fat Quarter Shop and a bunch of clearance yardage from Connecting Threads. I was able to sort through, measure and pet all that fabric before the week started. I'll do a more detailed post about the contents of the fabric boxes, later. Saturday I got to go fabric shopping, picking out baby fabrics for my SIL - Liz - she's expecting her first in April - AND they've decided to be surpised, so my Mom-in-law and I had fun looking for unisex fabrics. That's the only "project" I've got going right now. I'm really trying to make this attempt at school work. 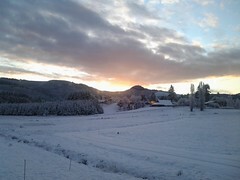 One final note - Winter finally came to the Pacific Northwest! Over the weekend we recieved over 4 inches of snow! It's so pretty, 29 degrees - cold!, and the kids are having a blast playing in it. I'm hoping they will get to go to school tomorrow - I know I need the time to work! 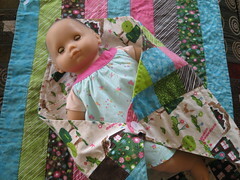 Your dolly blankets are cute! 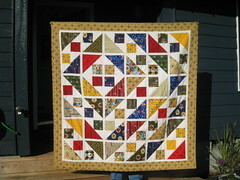 I like the pieced arch, and your colors are great for the little ones. I do like the quilt on top, too. What nice gifts. Good Finishes!